Not much is known about Paton Thomson. 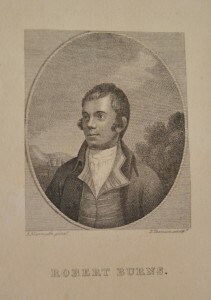 He was George Thomson’s elder brother, and contributed to a number of illustrations for George’s collection, as engraver (for ‘John Anderson my Jo’) and sculptor (Alexander Naysmith‘ portraits of Burns). He was based in London. 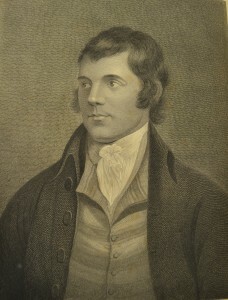 A few of his prints are held at the Victoria and Albert Museum, particularly portraits of theatre characters. 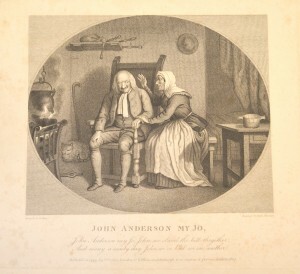 There are two versions of the illustration to the song ‘John Anderson my Jo’. 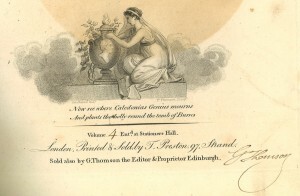 They are similar; one appears in the folio edition of George Thomson’s collection and is designed by David Allan, whereas the other we have as an unpublished proof, with a design by Thomas Stothard; both are engraved by Paton Thomson. 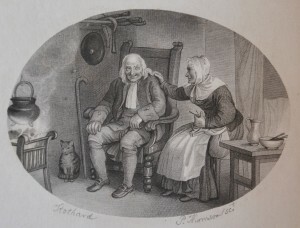 John Anderson and his wife are portrayed sitting next to each other in an indoor setting, with a bagpipe on a shelf above John’s head adding a very Scottish touch. Paton took over the job of John Thomson in sculpting the illustration for “Now see where Caledonia’s genius mourns”. John was evidently called to provide the illustration initially, as early editions of the collections show the vignette with “J. Thomson” specified below it. This eventually changed, and certain plates show a correction from “J” to “P”. 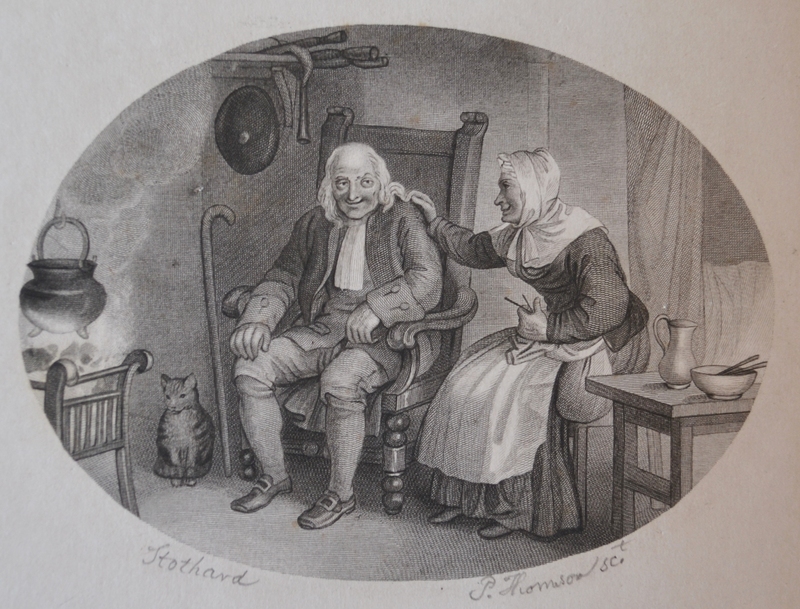 Later editions distinctly bear the inscription “P. Thomson”, with no sign of correction or alteration. The design is by Stothard. There are three portraits of Robert Burns by Alexander Naysmith in Thomson’s collections; they all sculpted by Paton Thomson. One is an oval, and it is based on Naysmith’s portrait of Burns which is possibly one of the most famous portraits of the poet that we have to this day; it was also made into a smaller version to fit the octavo publications. 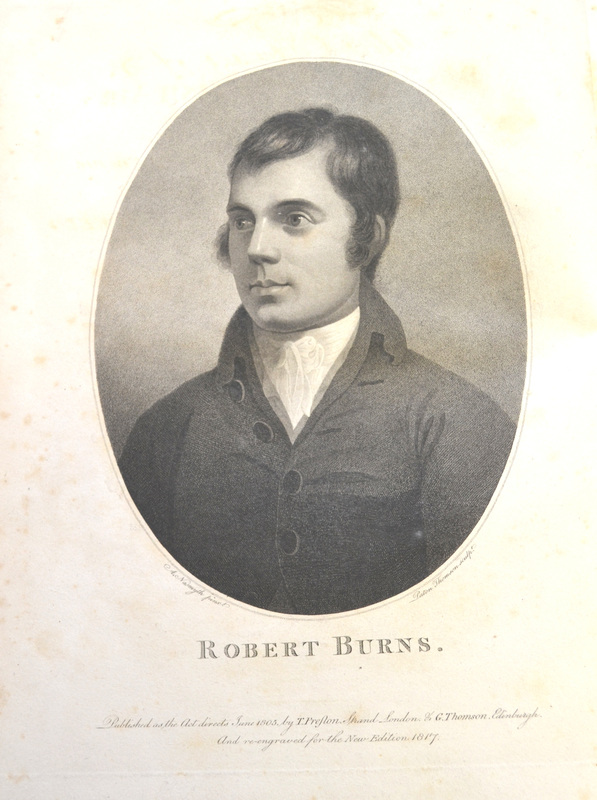 The third one is a rectangular engraving; Burns’ hair is slightly longer, and the background quite a bit darker. It is drawn by Archibald Skirving after Naysmith. George Thomson, in a letter to Byron’s publisher John Murray, also mentioned his brother’s work for Macklin’s Bible (see Thomson to John Murray, 14 Feb 1816 in the John Murray Archive, National Library of Scotland, MS 41188).